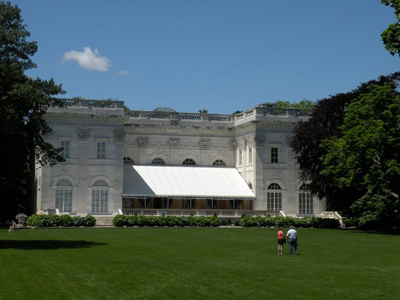 Marble House, the summer home of William K. Vanderbilt, is definitely one of the top 3 Newport Rhode Island mansions to see, in my opinion. The others being The Breakers and The Elms. This palatial estate was designed by William Morris Hunt and completed in 1892, cost around $11 million. It is said that the marble alone (over 500,000 cubic feet) cost $7 million! William Vanderbilt (whose older brother Cornelius II built The Breakers) gave this opulent palace to his wife, Alva, as a 39th birthday gift. I wonder how he topped that on her 40th birthday! Maybe he didn't get her anything, and that's why they divorced a few years later. Alva Vanderbilt, along with Caroline Astor, were two of the preeminent hostesses during Newport's Gilded Age. 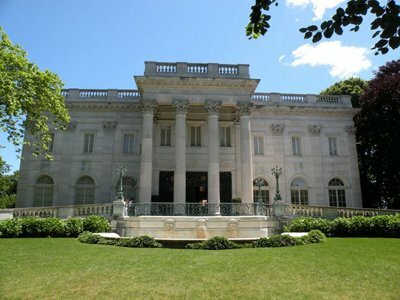 I can't imagine too many places I'd rather attend a party in Newport than this Vanderbilt mansion. Unfortunately for Alva, she and William divorced in 1895. 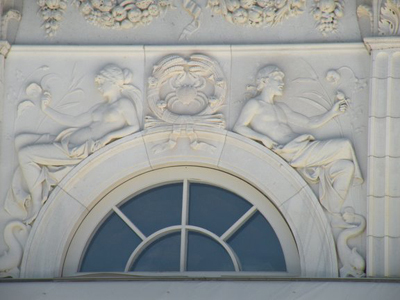 She wouldn't be able to throw any more parties at Marble House until she reopened it after William's death in 1920. 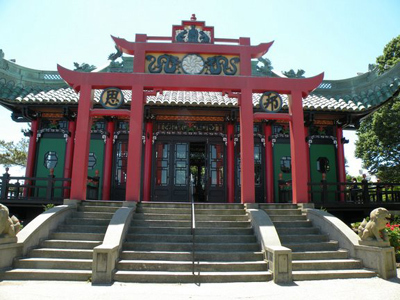 She enjoyed the Chinese Tea House on the back lawn, where she hosted parties then, and parties are still held here today. 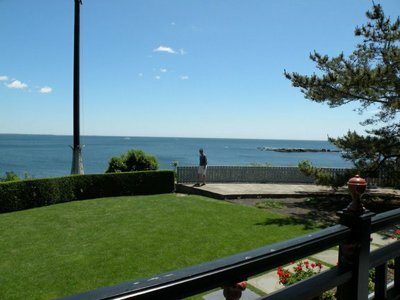 The Tea House was originally much closer to the cliffs overlooking the ocean, but was moved back to this safer spot in 1977. This mansion offers a self-guided audio tour. This allows you to walk around at your own pace and learn as much about the mansion (and those who lived and worked here) as you like. You'll definitely want to take your time here and enjoy the architecture, marble sculptures and incredible painted ceilings. Give yourself at least an hour and a half to tour the inside and walk around the outside as well. 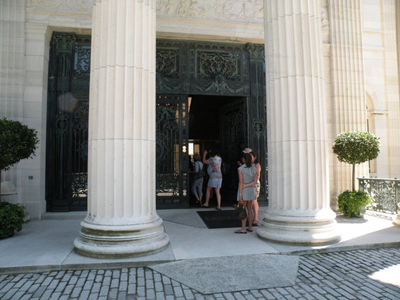 Marble House is an ideal location to hold an event, such as a rehearsal dinner or a corporate function. 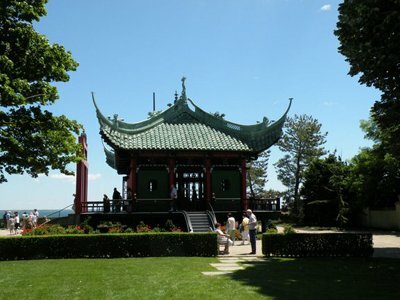 You can dine indoors and enjoy cocktails on the spacious terrace and down on the lawn at the Chinese Tea House. 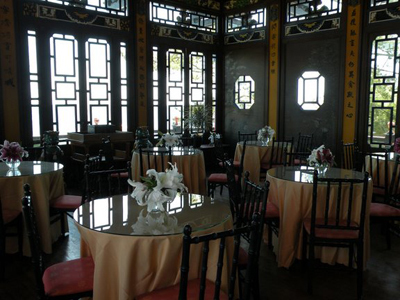 The capacity for a dinner inside the mansion is 240 people, and the Tea House can hold about 75 for cocktails. It is a little small for a sit-down event, unless you've got a small group of 30-40 people. Contact the Special Events Department at 401-847-1000 to make these arrangements. 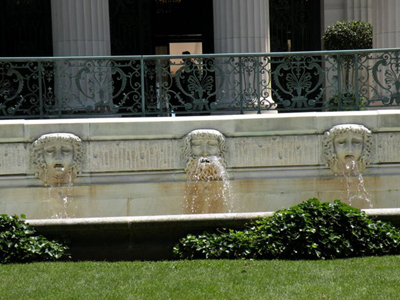 To get here, just head south on Bellevue Avenue. The house is on your left, just after the Astors' Beechwood mansion. You can take a leisurely walk down "The Avenue", drive (free parking across the street) or take the RIPTA trolley that leaves from the Newport Visitors Center. 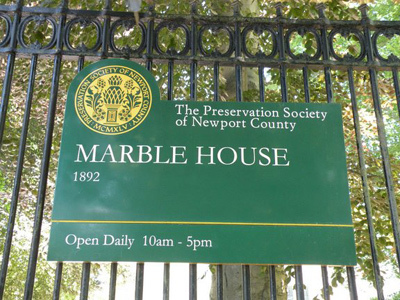 For detailed directions, see the map on our Newport mansions page.